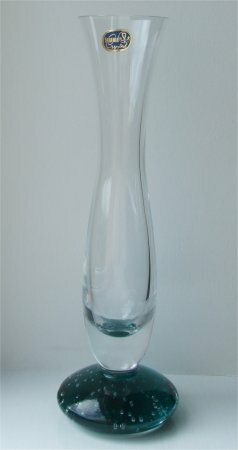 This vase is approximately 230mm (9 1/16ths") tall, and comes complete with its box. It has mainly small randomly spaced bubbles although there are a few larger elongated ones at the bottom. 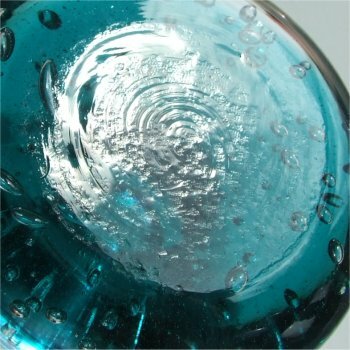 The base is a bluey green colour, and has a flattened ball shape. The bottom of the base is flat and has a creased finish. The stem is clear and has a bulbous shape at the bottom, and flares out at the top. It is 50mm (approximately 2 inches) diameter across the top. 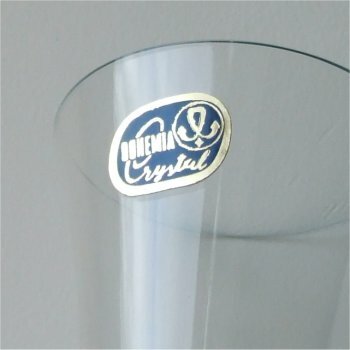 The paper label is an oval shape and a metalic blue colour with a silver border and writing which states "BOHEMIA Crystal"
The four sides of the box show that the vase was also available with a clear base, a blue base,and a mixed colour base of blue green and orange/yellow (see images below).